What can the Clear Flow™ Water Hose be used for? RV camping, boats, nurseries, construction sites, and the food industry. This non-toxic, non-leach product is made from tested and approved materials. The flexible, clear polyurethane hose = clear passage for UV rays that help kill toxins, algae and bacteria growth. Flat-to-round memory makes it the best expandable garden hose that forces water to drain. This discharge hose is no freeze and there’s no water build up. 100 feet of Contractor retractable garden hose weighs ONLY 6lbs! The flat polyurethane design allows the hose to self-discharge, making it is the best lightweight garden hose on the market! Polyurethane is one of the toughest materials known to man, durable in hot and cold climates (winter-proof to 14F without windchill). This flat hose remains flexible until -40. No leak crush proof, freeze resistant and lead free nylon hose fittings. It is a great high pressure water hose and can claim the title as the best garden hose in the world! It is so light!!! Feather light! It doesn’t kink, and if it does, it unkinks itself! Without water in it, the hose is flat, when the water comes through, it becomes round. It takes up no room for storage! I picked up two of these hoses. 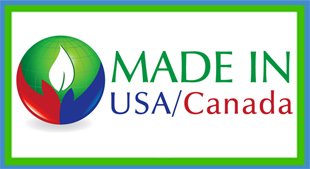 They are also made in the USA . Highly recommend these hoses!!!! Contaminated Water from Build-up? That familiar rubber smell? Water build up in traditional water hoses becomes stagnant, and within the darkness of the tube toxins and algae can build up. In the USA almost every water hose fails to meet drinking water standards. They are unregulated and hazardous. Children and their parents, our animals and our gardens don’t have to drink from these conditions anymore! The Clear Flow™ compact water hose is lead free and drinking water safe. It is the best kink release garden hose on the market and backed by expert and consumer testimonials. 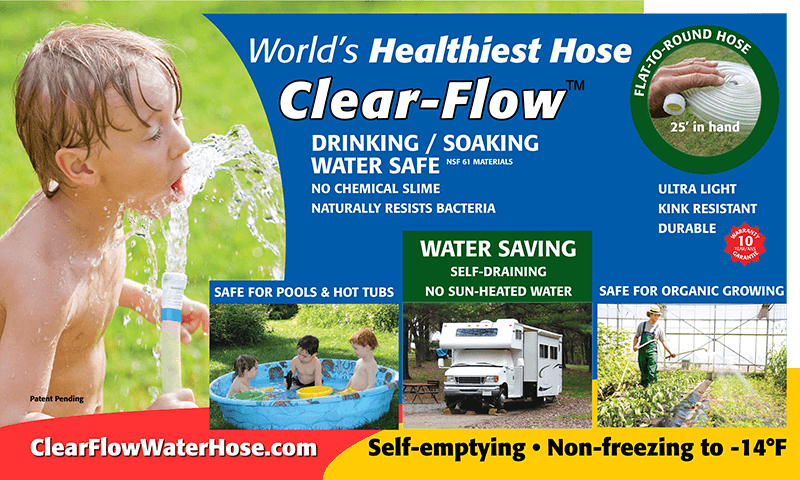 The Clear Flow™ brand will be recognized at every home as the best water hose! 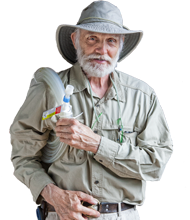 The Ecology Center based out of Ann Arbor, Michigan, conducted tests on water coming from the standard rubber garden hose and they found neurotoxins, lead and endocrine disruptors, especially in older rubber garden hoses. 5/8”ID when expanded under water pressure. Functions to temperatures of -14F and to 90psi. This flat garden hose is compact and stores really easy, not requiring a water hose reel. This is a self-discharging hose. A 25ft hose empties in 3-4 seconds. Safe materials for potable water and UV stabilized. The strong, nylon garden hose fittings are pressure tested and lead-free. 3/4”ID when expanded under water pressure. Functions to temperatures of -14F and to 100psi. This flat contractor hose is compact and stores really easy, and is extremely lightweight. This is a self-discharging hose. A 35ft hose empties in 4-5 seconds. Safe materials for potable water and UV stabilized. The strong, nylon fittings are pressure tested and lead-free. 7/8”ID when expanded under water pressure. Functions to temperatures of -14F with 125psi. This heated water hose is excellent for mining, breweries, plumbing, wineries, greenhouses, agriculture and municipalities as a non-freezing bypass hose (for temporary water supply), lightweight and durable and cold-temperature flexible. Labor saving, one worker can carry this hose! Safe materials for potable water and UV stabilized. 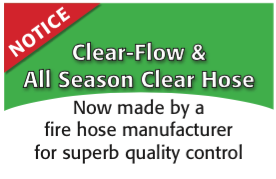 Clear Flow™ Water Hose is Available for Purchase in all Canadian Home Hardware Stores!